Taking the Amanda Knox murder case story from 2007 (in which Knox was accused of murdering her flatmate Meredith Kercher) Winterbottom attempts to turn its tragic elements into a discussion on love, perspective and the contradictions and foibles of the press. His ambitions were evidently honorable and clear-sighted however they were lost somewhere between transitioning from his mind to celluloid and the resulting film is a mess of ideas, half baked strands and frustratingly impaired attempts at something greater than what we ended up with. 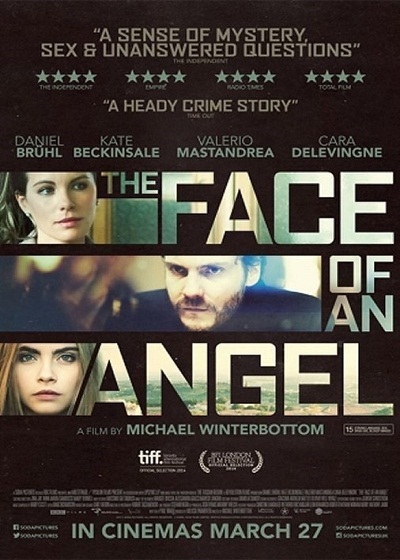 In The Face of an Angel we follow Daniel Brühl, who does a decent job with the material he is given, as he visits Sienna in order to discover details about the highly publicised murder of a female student four years ago. Brühl plays a filmmaker in a role that somewhat mirrors Winterbottom himself as they dig into their respective stories, Winterbottom into Knox’s and Brühl into a near identical pseudonym, in order to discover details for their next film. There is nothing malicious nor exploitative in Winterbottom’s intent as he aims to tell a story which isn’t simply a who dunnit but which instead doesn’t try to answer the question of whom murdered whom in favour of a discussion on the nature of truth and the way individuals and societies can view information. Unfortunately it’s a decidedly muddled affair which mixes themes of infidelity, love and death together with no meaningful outcome. Alongside Brühl we have Kate Beckinsale and Cara Delevingne in supporting roles. Both convince in their roles of a story driven journalist and a local bartender respectively, although the high level of praise being directed at Delevingne is misplaced. There is nothing technically wrong with her work here but she isn’t asked to do too much in the role and she certainly needs to display a far greater depth in a more challenging role before she can be told she has delivered ‘one of the most bracingly brilliant performances by a British actor for long, long time’¹. On paper The Face of an Angel sounds brilliant; a film that sets out not to treat Kercher’s murder in a sensationalist manner but with care, love and a fresh perspective that looks at issues to do with truth and how contemporary culture treats and perceives its media. The resulting film is a missed opportunity and its a real shame. Tantalisingly we can catch glimpses here and there of what the film wanted to be, but Winterbottom cannot tie all of his different angles and elements together in order to create a cohesive and compelling experience. What is the film’s greatest strength? Brühl’s lead performance. Its greatest weakness? It’s execution is confused and immature. Would I see it again? No, once was enough for this one. Thanks for reading, please do fire your thoughts out in the comment box below! Soda Pictures have released the collection today which you will be able to buy from Soda themselves, from Amazon and every self-respecting retailer. I really like Daniel Bruhl. Sad to hear thusthis wasn’t very good. Love Bruhl. Very curious about Delevingne as an actress but think I’d better choose another film to discover her in. I love him too but this wasn’t up to much. Yeah perhaps Suicide Squad might be one to see her in. Are you planning on catching that one? Rewatched Bruhl in Rush a few mins ago. So great in that! I haven’t actually seen Rush, is the film itself any good? Yep. It’s actually a pretty solid film. Thor actually acts in this one! Haha I do want to check it out at some point! ← Last Chance to Win Of Girls and Horses!